Did you know that Sherlock Holmes was able to cinematically link together 'Magnum P.I.' and 'The Equaliser'? Yeah. Straight up! You can see how by watching the following 90 minute-movie made in 1990. It was Directed by: Stuart Orme; and Starred: Edward Woodward, John Hillerman, with Anthony Andrews. Look into my eyes, Mycroft Holmes (Peter Jeffrey). Look deep into my eyes and try to remember what you have been through over the last couple of days. 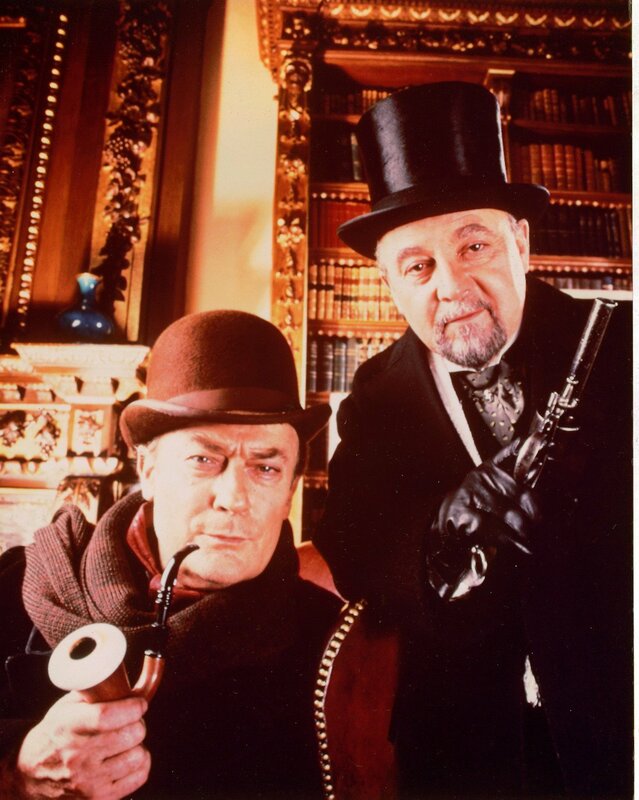 First I want you to recollect how you felt when your brother Sherlock (Edward Woodward) told you how he'd rather investigate the recent escape of his old foe, Professor Moriarty (Anthony Andrews), than aide you and Colonel Gould (Warren Clarke) with your case of international espionage. Then I want you to evoke how he changed his mind after some top-secret documents were stolen from your office. And now I want you to give me the clandestine codes so I can actually decipher what these stolen documents mean. Come on, Mycroft. I know you can do it even in your current hypnotized state. Please try to point me in the right direction or else my boss Moriarty might kill me just like he's done to his other accomplices. For am I not pretty. For am I not charming. And for am I not the sultry swindler called Sophie DeVere (Kim Thomson). Then again, that's most probably why I curse your abduction when the mastermind of crime starts to take matters into his own hands. 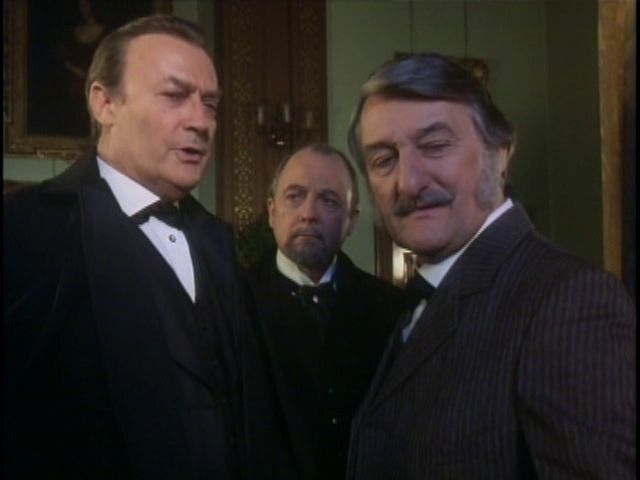 As Doctor Watson (John Hillerman) has something to say - a counter-attack leaves everyone at bay - a sneaky Colonel is nobody's fop - at the end of the day, a sudden death lead's to a final and fateful drop. 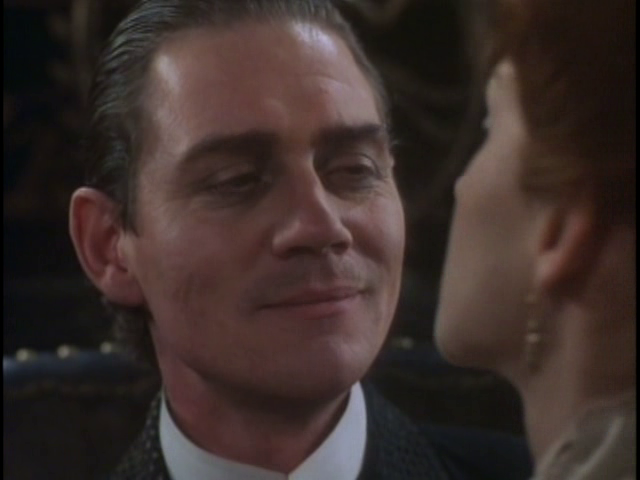 If you're a Sherlock Holmes fan like myself, then you'd most probably know that the 'Hands of a Murderer' was a nineteen-ninety's remake of the 1945 Sherlock Holmes classic, 'The Woman in Green'. But if you didn't know this fact, let me just add that this was a fairly decent murder mystery to follow, with some rather hard-boiled production values, plus a couple of additional characters thrown in for good effect. Now one of the characters I'm referring to is that of Sherlock's elder brother, Mycroft, who as always gives a much more interesting dynamic to the general narrative. The way I see it, it's as though his pious inclusion has given this piece a personal and associative tone, despite Mycroft himself coming across as a moderately pompous git. Another character I best mention is the one played by Warren Clarke -- called Colonel Gould. But unlike the Mycroft role, the only aspect he lent to this adventure was that of dread and imposing fear. Plus -- without giving too much away -- two thirds through it was somewhat obvious why he was tacked onto this tale. Of course I could now go on and tell you about some of the other additional characters seen in this production. Like how the sight of Kim Thomson gave me a stirring in my loins' whenever she was on screen. Or how I smiled like a loon when I saw the 'ever henchman' Christopher Fairbank pop up. 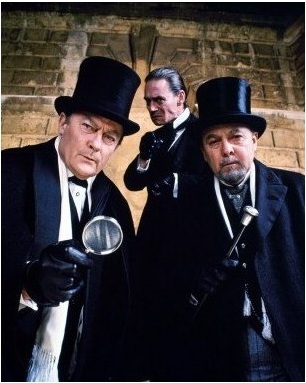 But to be completely honest with you, folks, even though the supporting players did support the structure of this story, I'd rather spend my time telling you what I thought about Edward Woodward, John Hillerman, and Anthony Andrews, playing Sherlock, Watson, and Moriarty. Well, as most of us know, our Ed will always be known in the eyes of the world as the hard nosed Robert McCall seen in the TV series, 'The Equaliser'. And to a certain extent you can say exactly the same thing about John too, but in the mould of 'Magnums elderly side-kick'. Having said that, though, as push comes to shove I'd still say they did a pretty solid job at playing their respective parts. Despite Edward's version of Sherlock feeling bolder than normal, in the same breath his no-nonsense attitude actually allowed me to suspend disbelief on occasion. Plus on a similar level you can say the same thing about John's version of Watson, even if he did come across more placid in deportment. And as for Anthony's version of Moriarty -- Wow! -- What a nice surprise that was! Not only did Tony give this part a more slippery and sinister edge, but here and there I thought his portrayal was very modern looking by default. Sleek even. But wait up! I think it best if I stop myself there, folks. Cause if I go on any longer I won't have enough time to splurge out the following filmic facts. (1) The CBS television network first broadcast this TV movie in America on the exact same day 'The Muppets' creator, Jim Henson, tragically passed away. It was on the 16th of May, 1990. 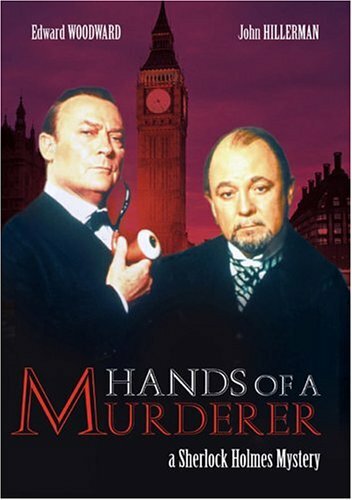 (2) Loosely translated, this project was entitled 'The Hand of the Assassin' in France, 'The Killer's Hand' in Hungary, and during pre-production it was given the working title, 'Sherlock Holmes and the Prince of Crime'. (3) Charles Edward Pogue, who wrote the screenplay for this flick, also adapted the Sherlock Holmes movies featuring Ian Richardson, such as 'The Sign of Four' and 'The Hound of the Baskervilles'. (4) The majority of this mystery was shot on location throughout the two English cities of London and Cheshire, most notably select parts of Warrington. (5) One of the taglines used to promote this picture, was, 'Can Sherlock Holmes resist the ultimate challenge?'. (6) There are a number of references made throughout this film which are historically inaccurate. One of them relates to Holmes actually being 'dead in the books' whilst this adventure took place -- 1900. Whilst another one relates to the 'Strand story' Watson mentions in this flick -- 'The Adventure of the Engineer's Thumb' -- which happened seven years earlier. (7) The music for this movie was composed by the noted musician, Colin Towns, and he's best known for composing the theme tunes for such English television series as 'Doc Martin', 'Pie in the Sky', 'Dalziel and Pascoe', and 'Cadfael'. (8) After this flick stalked a deer, Edward Woodward starred in the drama, 'Mister Johnson'; John Hillerman starred in the TV series, 'Valerie'; and Anthony Andrews starred in the romance, 'Lost in Siberia'. Overall I'd say the 'Hands of a Murderer' was a very nicely put together remake of an old school classic. Now I wouldn't go so far as to imply that it's better than the original. But at the same time, it's still a pretty decent film.